The FTP tool pushes code commits to an FTP server or SFTP server. You can use it to deploy and update Web sites. 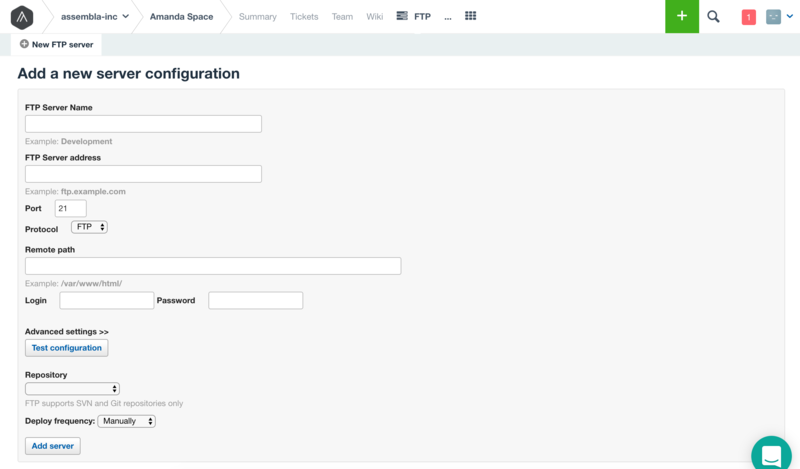 You can add the FTP tool to your workspace by opening your Space's Admin page and then opening the Tools page. Scroll down, and the FTP tool will be listed in the Build and Deploy section. FTP Server Name: Any name you want to give to identify this configuration internally. Used only as a recognizable label for your convenience. Remote Path: The folder path of the remote folder on your FTP server that you will deploy into. Login: The username of the FTP account that will be used by the FTP tool to write to your remote folder. Password: The password of the FTP account that will be used by the FTP tool to write to your remote folder. Repository: The folder in your Assembla repository that will be deployed. If you want to deploy from the root folder of your Assembla repository, you can leave this field blank. 2. Can I change the Remote Path after the first deploy? 3. How can I fix the deploy if I changed the content of the remote folder by hand? You should delete the FTP Tool from the Admin-Tools page, then add it and configure it again. You need to deploy to a new empty folder, or delete the existing contents on the remote folder before doing a deploy with the new FTP tool. 4. Will there be a problem if I configure two servers with the same Server Address and Remote Path? 5. Is there a limit of servers? Yes, you can have up to 50 FTP servers per space. 6. What if I get this error: 'FTP deploy fails with number of max retries exceeded'? Make sure your FTP credentials are correct. Try setting 'Active' and 'Passive' modes and run a test deploy to see if it works. Decrease number of concurrent connections to 5 or 3. Set up path from absolute (/trunk) to a folder containing small amount of files (like /trunk/folder).